Premier Carriers are based in East London and are specialist in compliant logistics support covering the UK and Europe. Thomas Everett, Managing Director, explains how Premier Carriers have achieved huge reductions in fuel use through FORS by closely monitoring the fuel reports and educating drivers on how to minimise fuel consumption and reducing our carbon footprint. As an ISO 9001 accredited company we did not expect any issues with our initial FORS Audit and passed first time and looked forward to the next Bronze audit. Our main reason for progressing to Gold was to demonstrate to our customers and vulnerable road users our commitment to road safety, the environment and to satisfy ourselves that we could reach and maintain the high standards required by FORS. 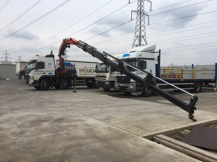 We took advantage of everything that FORS has to offer, we initiated eLearning programs for the transport staff, the classroom modules Safe Urban Driving and Van Smart with management working towards their FORS Practitioner qualifications. Performance data – We have seen improvements in our MPG performance, our accident rate has dropped along with the number of PCN’s issued. We have seen rises in our output for CO2, NOx & PM10 due the increased distances covered during the 2017/18 period. Driver health and fitness review – all drivers are subject to periodic health reviews and actively encouraged to inform management of any issues that could have an impact on their driving. Recruitment of drivers – Our core drivers have been with us for years so we tend to have a very low turnaround with employees. We do encourage our drivers to be on the lookout for potential drivers be that family, friends or other drivers they have met on their travels. Noise assessment – We carry out noise assessment on our vehicles and equipment, drivers have received toolbox talks on noise reduction, HIAB operators have been instructed to use slings instead of chains where practicable, drivers have been trained on the use of hand signals rather than shouting instruction during loading or unloading operations. Modal shift and alternative vehicles – We have looked at alternative powered vehicles and due to the long distances covered it is not practicable as we could not complete these journeys. However, our depot in Dagenham is used as a consolidation centre where goods are delivered by other contractors for individual projects. The project managers liaise with us to make full deliveries rather than have 30 or 40 deliveries per day from different courier or haulage companies. We are always looking at ways to improve road safety, reduce our carbon footprint and our impact on the environment. We have a Direct Vision Cab vehicle in our fleet and looking to increase this number as the older vehicles are taken out of service. All new vehicles must meet the ULEZ requirements and where practicable alternative powered or fuelled models will be added to the fleet. 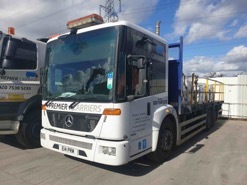 We promote FORS on our company website, our company documentation, email signatures, FORS logos on all our vehicles and on our driver and public notice boards. We have also introduced other companies to FORS over the years to which they have joined. Retaining our FORS Gold accreditation for another year promotes the company as a dedicated transport operator who is striving to reduce our harmful impact on the environment, reduce our carbon emissions, promote road safety, continue to protect vulnerable road users and ensure their safety at all times.